It’s no secret that Tatuaje brand owner Pete Johnson enjoys fusing his favorite elements of wine culture with his own premium cigars. He even introduced a sister brand, L’Atelier Imports, in 2012 to focus more exclusively on the shared properties of the two crafts. 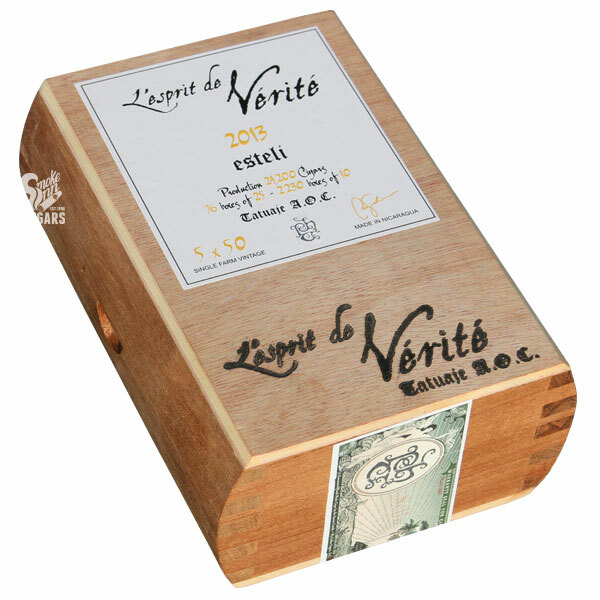 But perhaps the most in-depth integration of time-honored winemaking practices into the cigar realm came in 2010, with the introduction of a special project titled La Vérité 2008. The name translates from French to mean “The Truth”, and borrows a sought-after winemaking strategy of showcasing ingredients from a single farm and vintage. In the case of La Vérité, the cigars showcase leaf from the García family’s La Estrella farm in Estelí, Nicaragua. The tobacco is then rolled and allowed to rest in Tatuaje’s aging cabinets for one year before shipping to consumers. 2016 marks the third release in the La Vérité series, beginning with 2008, then 2009, and finally La Vérité 2013. The year represents the tobacco vintage, meaning 2016’s release showcases the most mature blend to date. In each release, two sizes were offered: a 5” x 50 robusto titled L’Espirit de Vérité, and a 7” x 47 churchill that is simply known as La Vérité. The 2016 release is no different, releasing the two sizes in a variety of packaging arrangements and limited quantities that make for a collector’s dream cigar. In total, only 21,600 churchills have been produced and 24,400 robustos, which have been split up among the various packaging arrangements offered. For La Vérité 2013, the blend showcases primarily Criollo ’98 tobacco, with Nicaraguan Habano and Corojo ’99 rounding out the blend. With two year’s age before rolling, and an additional year and a half resting in special aging cabinets following the rolling process, La Vérité is surely among the most exceptional smoking experiences you will find.